Each year, the Science festival is a unique opportunity to discover the world of scientific research, see demonstrations, meet researchers, engineers and lab technicians. The lab will open Saturday, October 10: save the date! The lab will open Saturday, October 18. 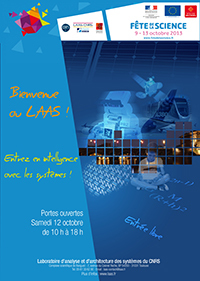 In 2013, LAAS-CNRS opened Saturday, Sept. 12. More than 700 visitors were able to discover research and powerful technological resources of our laboratory. The program included demonstrations, tours and workshops for children up to 10.